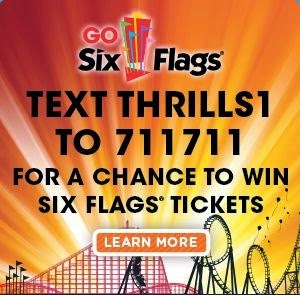 Text thrills1 to 711711 to enter the sweepstakes to win tickets to Six Flags. Enter daily from July 2, 2014 to September 2, 2014. There will be 15 winners every week! Also Text the word- SIXFLAGS to 711711 and you’ll get a link to a coupon for a FREE Medium Slurpee at 7-Eleven. Use it through 12/31/14. Make sure you’re near a 7-Eleven when you click redeem you will only have 15 minutes to use it! Click the link below to go to the 7-Eleven website.